Google is now experimenting with its new upcoming Chrome Browser Version 10. 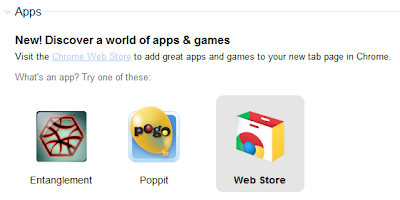 It seems that Google wants to include every new feature in Chrome 10, According to the sources Google is now integrating free HTML 5 Games in Chrome 10. According to the Google Operating System Blog the Chrome 10 Dev Channel build will include two HTML 5 Games; "Poppit and Entaglement". So If you are running the Dev Channel build, the games will install themselves automatically. If you don't want them you will need to uninstall them manually. Poppit is a game where your primary objective is to pop groups of like colored balloons. Popping the balloons releases prizes, once you've collected all of the prizes you win the game. Entanglement is a puzzle game that takes place on a hexagon shaped board with hexagon shaped pieces. You have to connect the pieces to create an unbroken line by laying down tiles next to each other without going over the edge. Many are wondering if the added software is a sign of things to come for Chrome OS, or if it's just a small addition to get people excited about HTML5. The consensus among online users seems to be that Google should ask or suggest software before installing it or including it into the OS.